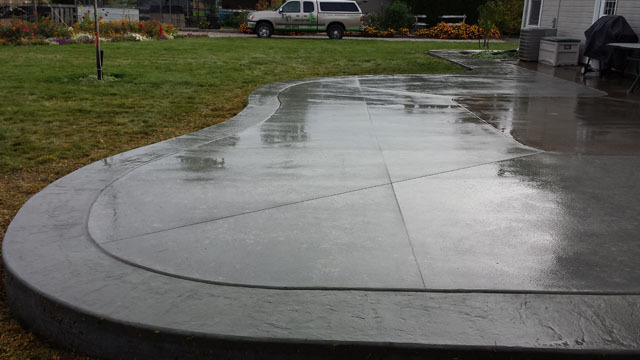 We specialize in concrete, and we do it right! With a guarantee on all our workmanship, our concrete crew will have your back patio, driveway, sidewalks, and any concrete we do looking fantastic and lasting a long time, just like you need it to. Is your concrete cracked, sloping the wrong way, or chipping or flaking? We can fix that. What sets us apart from some concrete finishers is that we use fibermesh for extra strength, and we dowel into any existing concrete to provide you with the highest-quality concrete possible. Carefully preparing the area and pouring the concrete the right way are very important, and we make sure your concrete gets done right from start to finish. …Basically everything you need to have concrete you can be proud of!